Researchers have learned that the first three years of a child’s life are critical to his/her development as the brain develops more rapidly during this period than at any other stage in his/her life. Children are discovering who they are, who you are, how to relate to others as well as how others respond to them. They are developing the foundation for their emotional, social, physical and cognitive development (The Creative Curriculum for Infants, Toddlers, and Twos, Dombro, Colker and Dodge, p. 3). As with the Creative Curriculum for Preschool, teachers of infants and toddlers are guided by the understanding of how a child develops – what is age appropriate – while individualizing care for each child. Focus on the environment ensures a safe, healthy and stimulating place for children. The respect for family involvement and diversity are ingrained in this curriculum model as is respect for the child as a capable learner. Our program offers children the opportunity to experience a wide range of expressive media, for example: clay, watercolors, tempera paints, light, shadow, cooking, collage and rhythm and movement. 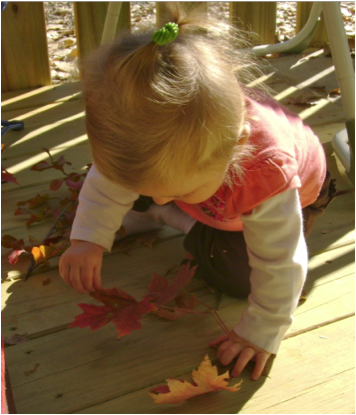 Children explore an environment that encourages investigation, curiosity, imagination and experimentation. We discover the wonder of the natural world though sand, water, gardening and natural materials. Children learn how to build relationships with other children through shared experiences and negotiated play.